A glowing ball of light. The Glo-Ball emits a soft, glowing light that will make you feel warm and fuzzy inside. Jasper Morrison designed this lamp to resemble the glowing light of a full moon on a clear night. The Glo-Ball S floats in the air from a steel suspension cable. Available in two sizes. A white acid-etched blown glass shade is almost sculptural. It effectively diffuses the bright light given off by the halogen bulb in the center of the diffuser. 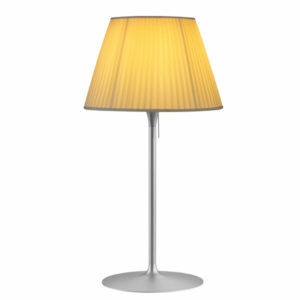 Available with a halogen or fluorescent light source. For a more eco-friendly option, choose the fluorescent bulb, which consumes less energy. This fixture is meant to be hardwired or have a plug attached to the cord.